At the end of World War II on August 6, 1945 an atomic bomb was dropped on Hiroshima by the Americans. The plants and trees in the area around the epicentre were examined in September 1945. Among the survivors were the six Ginkgo biloba trees shown on this page. They were situated near the blast center and appeared to bud after the blast without major deformations and are still alive today. Therefore the Ginkgo is regarded as the 'bearer of hope'. 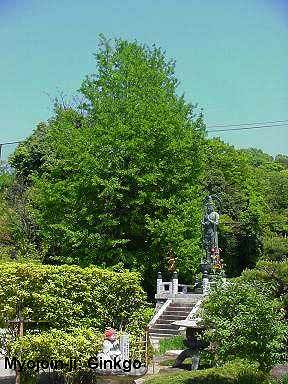 This Ginkgo situated near a temple about 1130 m away from the hypocenter appeared to bud after the blast (the temple itself was destroyed). The temple-site in Housenbou was smaller after the war and they considered transplanting or cutting down the Ginkgo to rebuild the temple. In 1994 it was decided to leave it there and adjust the temple to it, so now the main building has stairs in front divided into left-and right hand sides, protecting the Ginkgo inside this U-shape. Engraved on it "No more Hiroshima" and people's prayers for peace. This tree has thus become an international symbol. Estimated planting 1850, 15 m.
Location: 3-3 Tera-machi, Naka-ku. Near Nishihongan-ji and Zensho-ji. Close to Betsuin-mae streetcar stop on line 8 to Yokogawa JR station. More photos of this tree here. Ginkgo at Shukkeien garden (founded in 1620), 1370 m from the blast. Plaque: "After the dropping of the bomb almost all giant trees in the garden were burnt. This Ginkgo is one of the trees that survived. Girth 4 m, 17 m, age about 200 years. 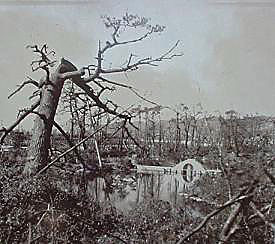 The tree toppled because of the blast and the tree was pruned to prevent it from falling over." Read more about a sapling of this tree planted at UNITAR Geneva in 2016 on my website and blog. 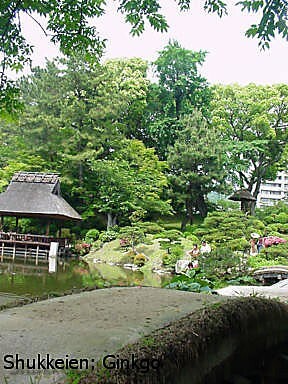 Just a short walk from JR Hiroshima Station; in the garden right of the pond, near low bridges. Ginkgo at Josei-ji (temple), 1420 m from the blast. 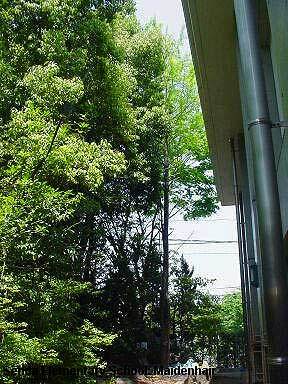 It is said this Ginkgo was planted in 1900. When the bomb fell the tree was located next to a factory with high walls that protected the tree from destruction. After the war the temple has been rebuilt three times and each time around the tree. Plaque: "This Ginkgo withstood the atomic bombing on August 6th 1945. 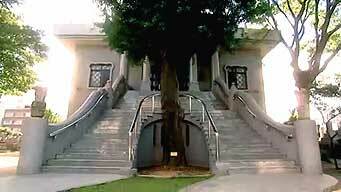 When the new hall was constructed in 1981, the tree was preserved by building the staircase around it." Ginkgo at Senda Elementary School, 1650 m from the blast. Plaque: "Senda Public School was completely destroyed in the atomic bombing on August 6, 1945. The only thing that remained was the bent steel framework of the auditorium. After the war, this framework was recycled as an aviary, and is still used as such. 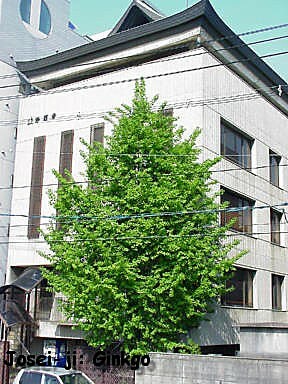 Both this Ginkgo tree and the framework withstood the bombing, and scars from the blast can be seen on its trunk." When the grounds were converted to an elementary school, the remains looked rather bleak, and so it was decided to move them to this location. A rope was wrapped around it, and it was hoisted up like a stone using a crane, and then wrapped in wire. People keeping an eye on its condition in the months that followed noticed that new buds had begun to appear.In the Tales of Senda Elementary, Mr. Sakai writes that he was so happy to see the new buds appear. "It is important for us to treasure this tree, learning about how it withstood the fierce atomic blast. In doing so, I'd like everyone to come to know what the atomic blast was like." Location: near Miyukibashi (bridge) which was made famous by the well-known A-bomb photo, and Senda Park. 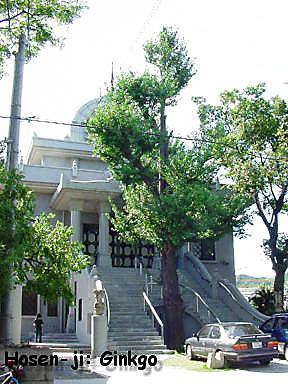 2-1-34 Higashi-senda-machi, Naka-ku, left of main entrance as you come in, squeezed between the fence and the gym. Ginkgo at Myojoin-ji (temple), 1780 m from the blast. Plaque: "This Ginkgo survived the atomic bombing on August 6 1945." Location: between Tsuruhane-jinja and Nijistu-jinja. North of Hiroshima JR station and near Tokiwa-bashi Bridge. 2-6-25 Futaba-no-sato 2 chome, Higashi-ku. Ginkgo at Anraku-ji (temple), 2160 m from the blast. The temple was restored in 1948. A hole was made in the roof to create space for the tree to grow. This Ginkgo has grown from a cutting taken from a 12th century tree at Zenpuku-ji Temple in Tokyo. The cutting was taken to Hiroshima during the Edo period. 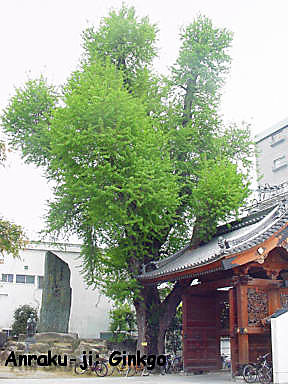 Plaque: "This Gingko withstood the atomic bombing on August 6th 1945. There are still scorch marks on the upper part of the trunk from the blast." Watch this documentary film about A-bombed Ginkgo trees in Hiroshima. With thanks to Mandy Conti for giving me permission to show you these photos.